Days of Our Lives Recap: Hope Was Nice To Ben! Days of Our Lives Recap: BREAKING: Hope Was Nice To Ben! 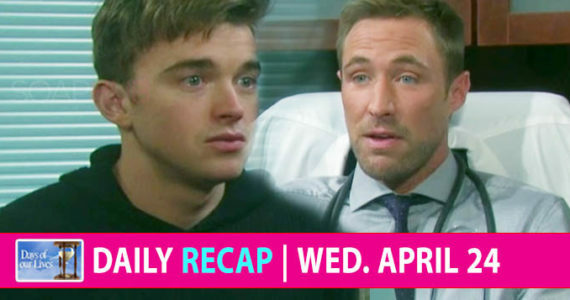 The Days of Our Lives recap for Friday, February 15 features hell freezing over when Ben gets a kinda-sorta apology from Hope! Will she survive the ordeal? We think, yes, probably. Ciara (Victoria Konefal) stepped in front of Ben (Robert Scot Wilson) to protect him from Hope’s (Kristian Alfonso) gun and Hope finally gave in after Chad confirmed Ben’s story. Hope apologized to Ben, but he said he wouldn’t have believed him either. At the hospital, Hope told Ciara she wanted them to be close again. She asked Hope to be nicer to Ben. Ben told Hope if she has to press charges against him, he won’t fight her, but then she left and Ben and Ciara affirmed they’re back together — until Jordan knocked Ben out! Ted (Gilles Marini) told Hope he’s never met a woman like her and shocked her with a kiss! She told him to never do that again just as Rafe appeared. Earlier, Rafe (Galen Gering) learned from Kayla (Mary Beth Evans) that Kate (Lauren Koslow) overdosed but not on the drugs he found. She left to check on Abby and Kate awoke. Rafe had to know why she tried to kill herself, but Kate told him it was Jordan who tried to kill her. Before knocking Ben out, an unhinged Jordan (Chrishell Hartley) was devastated that he was dead. Rex (Kyle Lowder) saw her and tried to help. She told him that she hasn’t been the same since a car accident last summer. Chad (Billy Flynn) updated Abigail (Kate Mansi) about Jordan and they treasured having their daughter back. Kayla made sure Charlotte was okay. Alone, Abby thanked Chad for being her rock and said she forgives him. She also said she wanted to get back together!